If you are struggling with the custom options for Grouped products, our extension is for you. 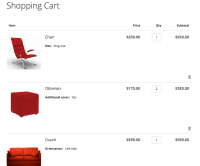 With it you display any custom options (also and required) for each simple product on a Grouped product page in a walk. So your customers can specify different requirements for each item. What Kind of Stores Is The Extension Designed For? Availability of grouped products encourages customers to buy in bulk more often, increasing the average order value of an ecommerce store. However, Magento 2 doesn’t offer the functionality that allows customers to freely change the colors, sizes, and models in products in groups. Store owners are strictly limited to creating grouped products from items that cannot be customized. This limitation can be extremely frustrating when you have products that almost always go together: bath sets, clothing, sportswear, electronic gadgets and their accessories, etc. It generally brings certain inconvenience and, what is even worse, may force visitors to abandon the cart and leave without a purchase. 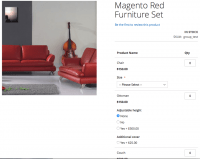 Grouped Product Options is handy Magento 2 extension that opens up an easy way of working with customizable product bundles. This is a turnkey solution that requires no additional customization, providing admins with an ability of adding and editing multiple attributes for products in groups. The extension takes off the burden of manual, routine adding of custom options for products in groups. Thanks to its easy and intuitive interface, the solution makes it possible to assign necessary product options within minutes, significantly simplifying the overall grouped products management process and saving your admins’ time. By offering a great variety of relevant products, online retailers win customer loyalty and satisfaction. And by doing so for products in groups, not only they attract more buyers to the store, but also improve their shopping experience, increasing the chances of a successful sale. With an ability to choose custom options for items in groups, customers won’t have to spend a lot of time to hand-pick the required configuration for each product – they will be able to do so for the entire group with just a couple of clicks. This will make the order placement quicker and easier, also simplifying further order processing for employees. Magento 2 Personalized Products extension – Provide customers with the opportunity to add images, prints and text to conventional products, set special prices for custom items and get ready-to-print files with designs. Product Ratings Magento 2 extension – Receive authentic and trustworthy customer testimonials for any products at your store. Magento 2 Product Dropdown & Quantities Increments extension – Adjust product measurements according to your specific business needs. Custom Product Options plugin for Magento 2 – Manage custom options’ settings, duplicate, edit and delete the generated templates, and present the best-selling product configurations first. Product File Attachments Magento 2 extension – Attach to a product downloadable user guides and manuals, video product overviews and customer testimonials using suitable file icons. Finnaly I found an extension to add my custom options to group products. I love group product functionality in Magento and use it extensively. So kudos to this handy module, it helps me a lot with my sales. I like that I can choose different attribute sets for products in my group. And the shopping cart view is quite informative, customers can see what they picked during checkout. I've had some issues with installation but aitoc support team was nice to help me out and fix it fast.